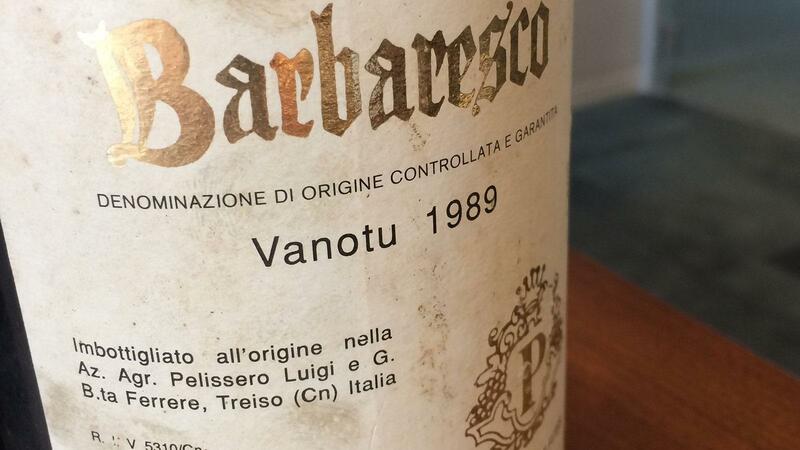 The 1989 Pelissero Vanotu was among the classic-quality Nebbiolos in a 22-vintage lineup. In Italy, Piedmont's Barbaresco has its namesake village, with its famous tower and Gaja. Neive is the largest township and home to Giacosa. Treiso, the other main township, often gets overlooked, despite boasting Pio Cesare's hilltop perch, Il Bricco. Higher in elevation and without the household names of its neighbors, the Nebbiolos of Treiso can be austere in their youth, due to higher acidities and assertive tannins. Yet, this is also their distinctive feature. Treiso is home to Pelissero, an estate whose majority of vineyards lie within Treiso. The one anomaly is its flagship Barbaresco, Vanotu, the Piemontese dialect for Giovanni and named after proprietor Giorgio Pelissero's grandfather. Vanotu hails from three different MGAs (Menzioni Geografiche Aggiuntive), each located in three different townships of Barbaresco: Tre Stelle lies within Barbaresco and includes the original parcel from Giovanni Pelissero, replanted by his son Luigi in 1964; Basarin lies in Neive and Marcarini in Treiso. In total, there are 10 acres of Nebbiolo. I recently tasted 22 vintages of Vanotu, non-blind, with its United States importer Dominic Nocerino of Vinifera Imports in Wine Spectator's New York office. All the bottles came from Vinifera's temperature-controlled warehouse, with the exception of the 1993, 1991 and 1989. All the wines were vinified by Giorgio Pelissero, the beginning of the new era at Pelissero since he took over with the 1989 vintage. Since 1991, the wines have been fermented in stainless steel, with roughly 15 days of maceration, spending 20 to 22 months in French barriques, 80 percent new, before an additional nine months in bottle before release. The defining style of Vanotu is freshness and elegance. Even as the fruit dissolves into tertiary notes of truffle, licorice and woodsy spices, there is sweetness, balanced by vibrant acidity. There is a nod to modernity, but the oak is not intrusive. However, I believe the use of barriques does result in a more rapid evolution of the wines. Freshness was evident in the 2004 Vanotu, a harmonious, classic Nebbiolo and my favorite of the group. Its complex nose of truffle, macerated cherry, licorice, tar and spice was matched by sweet fruit, with licorice, tar and spice on the finish. I put the 2011, 2001 and 1989 vintages right behind it in quality. I found similarities between the 2011 and '89, despite more than 20 years separating the two. They were elegant, with plenty of finesse, purity and detail, but while the 2011 delivered primary, fresh fruit flavors of cherry and strawberry with flowers and spice, the 1989 was aged fruit and spice, more of a confit, with an inherent sweetness. The 2001 had more power and structure, with a touch of austerity to its leather, tobacco, tar, iron and underbrush, the fruit maturing to plum and fruitcake. My next group of favorites included the 2010, whose aromas were beginning to develop sweet cherry, leather, tar and hints of rose, matched to a profile that was vibrant and long. Now at 10 years, the 2006 offered a complex bouquet of truffle, macerated cherry, rose, licorice and tar. Packed with sweet fruit, it was also firm, structured and long. Going back another decade, the 1996 was austere initially, opening up to reveal truffle, licorice, leather and tar notes, sweet and long. Most of the wines were outstanding quality (90 to 94 points on Wine Spectator's 100-point scale), with four reaching classic status (95 to 100 points); in some cases these wines showed better than in their formal reviews as new releases, indicating that Vanotu is capable of improving with age. The only exceptions were the 2000 and 1997 vintages, which seemed prematurely developed, and the 1994, from a difficult vintage that saw rain and hail.